Spišská Nová Ves is a small city (pop. 38,000), located at the northwestern edge of the Košice Region in Eastern Slovakia, on the country’s main railway line. Worth a half-day stopover or a leisurely day trip, perhaps on the way elsewhere, Spišská Nová Ves offers a glimpse into the medieval times on the backdrop of light industries and an event calendar energizing a sleepy town. The monikers “Metropolis of Spiš” and “Gateway to Slovak Paradise” best encapsulate the town’s appeal. 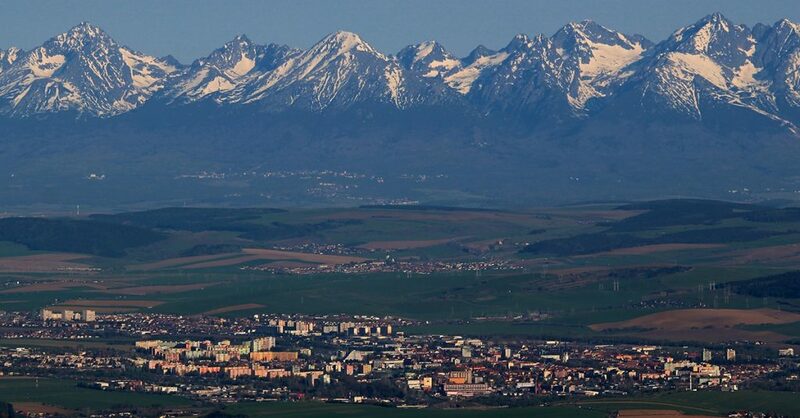 Spišská Nová Ves is the biggest city in the Spiš region and a convenient hub for trips to the Slovak Paradise National Park, less than 10 kilometers / 6 miles away. Further destination include the High Tatra and Pieniny National Parks, the medieval towns of Levoča and Kežmarok, and the biggest castle in Central Europe and a UNESCO treasure, the Spiš Castle. In 2018, Spišská Nová Ves celebrated its 750th anniversary. Spišská Nová Ves has the longest lenticular (lens-shaped) medieval square in Europe. The tower of the Roman Catholic Church of Virgin Mary’s Ascension is the tallest church tower in Slovakia (87 m / 285 ft) and has the most clocks (seven). The Greek Catholic Church of the Lord’s Transfiguration is the only temple in Slovakia to feature a large-scale (400 sq m / 4,305 sq ft) mosaic. The Roman Catholic Church of Divine Mercy has the world’s biggest glass cross located inside a temple (5.6 m / 18 ft). The Ivan Sokol International Organ Festival, held in September since 1970, is the longest-running organ festival in Slovakia. The tradition of the annual fair, Spišské trhy, dates back more than 600 years, to 1408. Farmers and domestic animal breeders of the Baden Culture inhabited the area of today’s Spišská Nová Ves since the Late Stone Age, approx. 5,500-4,000 BC. Slavs occupied the area from the 8th century AD onward. The first written record of Spišská Nová Ves, as Villa Nova (Nová Ves), an archbishop’s letter, dates to 1268, when the local survivors of the Tartar incursions banded together to establish a new settlement around the parish church, combining with the village of Iglov (to this day the Hungarian name for the city is Igló). The Hungarian King Bela IV repopulated the area with colonists from Saxony, who called it Neudorf, later Zipser (Spiš) Neudorf. In mid-14th century Master Konrád established a major bell foundry in town, making bells for the new Gothic church, which to this day dominates the town’s skyline. In early 15th century the fortified town earned a number of royal privileges, including a coat of arms and an annual fair. Soon after, the Hungarian king gave the town, along with 13 others in the region, as loan interest to the Polish king, whose successors ruled here until 1772. A plague ravaged the town in early 18th century after the Rákóczy Uprising. After returning to Hungarian royal hands, the town became the seat of the Thirteen (later 16) Spiš Towns province. Throughout the 19th century, trade and manufacture, particularly of stoneware, flourished here. In 1849 the Hungarian revolutionaries burned the city down; the main Church was subsequently renovated and the tower extended. The town received a boost from the construction of the Košice–Bohumín railway in 1871. The city was incorporated into Czechoslovakia in 1918 and then again after World War II in 1945. You can take in the town’s major attractions in half a day. A more leisurely stay, perhaps with day trips to the Slovak Paradise or Levoča, will allow you to experience the town’s laid back character. Come in the summer during the Spiš Fair (July) or Days of the City Festivals (August) for a glimpse into the local culture and history. Most of the city’s attractions are scattered along or around Radničné (Town Hall) Square, named after the seat of city government located there. The longest lenticular, or lens-shaped, medieval square in Europe, the Square is enclosed by two rows of buildings. 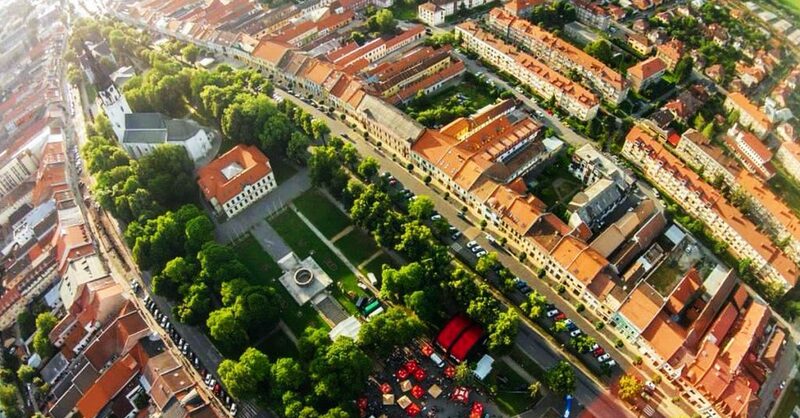 The structures along the north side are called Letná ulica (Summer Street, or Letušna in local dialect), as the street is exposed to the sun most of the day, while the south side, Zimná ulica (Winter Street, or Zimušna), remains in shade and, hence, colder in temperature. The Church of Virgin Mary’s Ascension, Evangelical (Lutheran) Church, Town Hall, and Reduta Theater are all located in the space between the Summer and Winter Streets. The three-nave basilica remains the city’s core and it is her most visible, recognizable, and valuable structure. Built on the site of an earlier church in the second half of the 14th century in the Gothic style, the Church of Virgin Mary’s Ascension was extensively renovated in the late 19th century. You can ascend the tower with a guided tour (see below, If You Go). During the climb, up 155 steps, you’ll pass one of the highest-placed belfries in Slovakia, where the oldest of five bells, named the Death Bell, was cast in 1486 by Master Konrád (the remaining bells are from the 19th and 20th centuries). The larger-than-life statues of four evangelists were carved from wood by a local sculptor. At the end of the trip, 360-degree views of the city, surrounding areas, and the High Tatra mountains in the distance, are well worth the labor. The gorgeous Gothic portal over the south entrance is the finest part of the church’s exterior. The relief, depicting the coronation of Virgin Mary, is one of the oldest sculpted pieces in the country. The two additional chapels also date to the 14th century. Outside the main, west entrance, a 17th century crypt used to serve as an ossuary. And the 1724 Immaculata Column, a national cultural monument, commemorates the victims of the plaque; renovated in 2010, its plinth contains a time capsule. 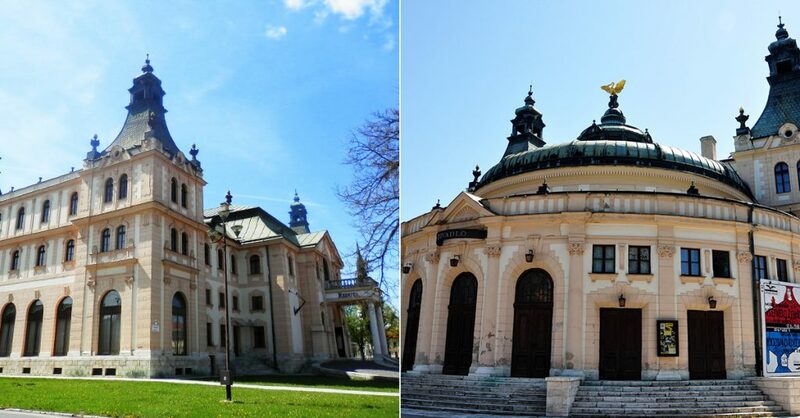 While a lot of the interior features date to the 19th-century remodel, a few original Gothic sculptures and paintings remain, including the Calvary statuary, near the south entrance, by the famed Master Pavol of Levoča (1520), a bronze baptistery by the bell-maker Master Konrád (1549), and an early-14th century reliquary cross. May 1–September 30: Monday–Friday at 10:00 and 11:00 a.m., and 1:00, 2:00, 3:00, 4:00 and 5:00 p.m.; Saturday at 10:00 a.m. and noon; Sunday and holidays at 3:00 and 5:00 p.m. Province House is the most interesting secular building in the city’s historic downtown. In medieval times it housed the town hall and later the administration of the 16 Spiš Towns province. It has housed the Museum of Spiš since 1954. Incorporated into the structure is the Levoča Gate, the only city gate remaining from the medieval fortifications, named after the destination of the road that started here. Detail of cartouches on the Province House. Photo CC-BY-SA Andrej Macko. The museum features permanent exhibits on the history of the building, the city, and the region as well as a natural-history section of the local flora and wildlife. The museum’s extensions in the villages of Smižany, essentially a suburb of Spišská Nová Ves, and Markušovce (See below in Beyond) further document the region’s history. If you come during the week or off-season, the staff may have to turn on the lights for you. 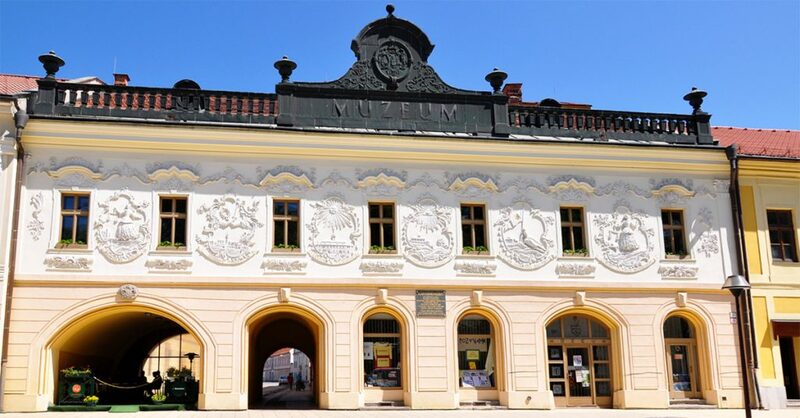 Housed in a 16th century Renaissance town house, the Gallery of Spiš Artists is a premiere showcase of the works of local painters, graphic artists, illustrators, sculptors, and photographers. In recent years, the curators have expanded their reach beyond the region and even the country. The most prominent artist, Jozef Hanula, has his own permanent exhibit of drawings and paintings; the Terra Gothica exhibit features art inspired by the Gothic period, so prominent in the region; and the sculpture garden includes works of artists from the Carpathian Mountains Region. Hours: Tuesday–Friday 9:00 a.m. to 4:30 p.m., Sunday 11:00 a.m. to 4:00 p.m.
Reduta. Photos (from left) CC-BY-SA Jozef Kotulič and CC-BY János Korom. The swan decorating the interior symbolizes song, as ancient myths had the swan sing upon its death. Jozef Hanula’s fresco above the stage depicts the High Tatras and its environs. 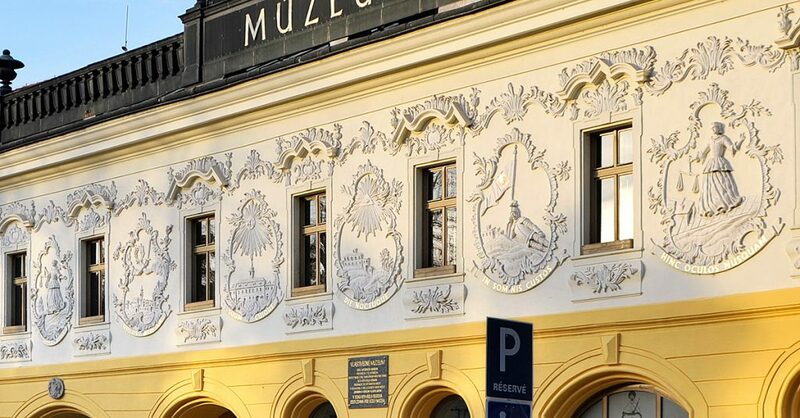 Even if you don’t see a performance in Reduta, the city’s performing arts center, stop by the restaurant to soak in the atmosphere of an old-school fancy-ish Slovak restaurant with a side of provincial arts. Sonata Restaurant/Cafe: daily 10:00 a.m to 10:00 p.m. The cross-shaped, blue-white Evangelical Church was built in the late 18th century in classicist style. Thanks to its great acoustics, the Church sees a lot of organ concerts, including the Ivan Sokol International Organ Festival. Evangelical Church. Photos (from left) CC-BY-SA Jozef Kotulič and CC-BY János Korom. The choir area houses an 18th century library, and in the front stand the freshly renovated statutes of apostles John, Luke, Mark, and Matthew, originally located at the city cemetery entrance. The final building worth checking out on the historical square is the Town Hall, a three-floor building built in the Classicist style in late 1700s. A large ceremonial hall in the center spans two floors. See the map above for the locations of these churches. The second newest church in the city boasts an impressive mosaic depicting the principal Christian myths, including the creation of man. Not to be outdone, the interior of the city’s newest church features the world’s biggest glass cross. It is green, as is the altar. Additionally, the church houses the remains of three saints and a number of gifts Pope John Paul II had received on his trips and donated to the Church. 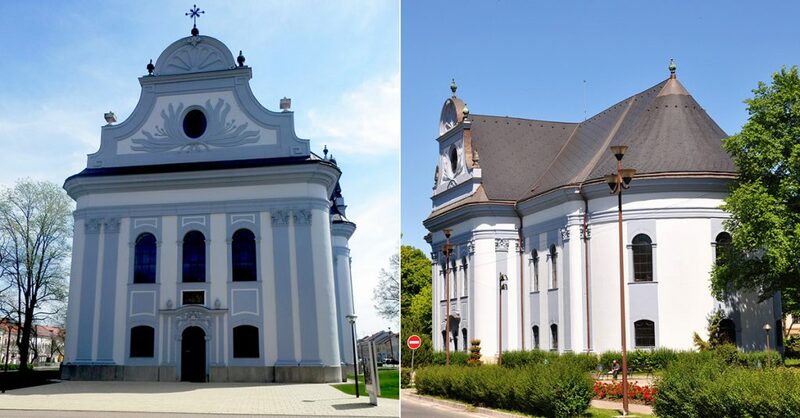 Located in Levočská (Levočská) Street, a side street accessible through the Levočská Gate in the Province House, the Immaculate Conception was originally (in the 14th century) a small chapel, which was in mid-18th century expanded into a full-fledged Baroque church. The last remaining vestige of the mid-19th century Jewish settlement, the cemetery has 280 graves. Tours to the cemetery, restored in 2007, are available in the Tourist Information Center. The cemetery is included in the Slovak Jewish Heritage Route. The monument Tribute to Master Konrád, featuring a 14th century bell, commemorates the first bell foundry in the Spiš region (1357-1527). Enter the half-bell part of the monument, located just outside the Tourist Information Center, look up at the sky through the slits, say a wish, and send it to the heavens by ringing a bell. Gimmicky or not, it beats polluting a fountain with coins. The Slovak Technical Museum, a local branch of the eponymous museum in Košice, features a permanent exhibit on mining in the Spiš region and an impressive collection of minerals and rocks. The Gallery of Unconventional Art showcases works by artists not represented elsewhere, including people with disabilities and amateur artists. Spišská Nová Ves airport runs a robust set of aerial programs, including sailplanes and paragliding. The most adrenaline-fueled adventure will have you rise to the sky for unparalleled views of the city, Slovak Paradise, Spiš Castle, and both the High and Low Tatras, and dive down with the aid of a parachute and an experienced tandem partner. Ice hockey is Slovakia’s national sport. Though the local team, HK (Hokejový Klub, meaning hockey club), is far from elite, the fans are no less raucous for it. Spišská Nová Ves is so small that a half-hour walk in any direction from downtown will take you outside the city. Modrý vrch (Blue Hill, know to locals by the German-derived name of the same meaning, Blamont) is a natural reserve a 40-minute easy hike from the main church (20 minutes from the train station). Further out, the Gateway to the Slovak Paradise is, indeed, an ideal starting point for hikes to the national park. A hike to one of the Park starting points, Čingov, takes about 3 hours from downtown. Buses* (regional and city lines as well as a special summer shuttle) leave the bus station daily. Erected in 2008 for the city’s 740th birthday, the 10-meter / 33-foot tall Slovak double cross stands atop a hillock, offering splendid eastward views of the city and the mountains beyond. The best time to visit Spišská Nová Ves is between May and October, when a plethora of events accelerate the city’s pace. In June, a graffiti festival and a night fun run bring the locals out into the streets. The Spiš Fair is the biggest event of the year, bringing throngs to the main square the second week in July, to stroll, shop, eat, drink, listen to music, and dance. Throughout July and August, an outdoor cinema is set up outside the Reduta theater. The biggest August event is the Days of the City of Spišská Nová Ves, a showcase of the city’s local-patriotism, with crafts demonstrations, folk arts/crafts fair, folklore and other music concerts, historical combat reenactments, and other attractions. Also in August, the long-standing Salon of Cartoon Humor lightens the summer’s swelter. And the new (since 2017) Festival of Living Statues takes the characters so familiar from cities around the world to the next level. In September, see sacral music at the Ivan Sokol International Organ Festival, Slovakia’s oldest festival of church organ music. In October, the Musica Nobilis International Music Festival takes place in eight regional cities and towns; the location in Spišská Nová Ves is the Evangelical Church. The December Christmas Market caps the calendar of events in Spišská Nová Ves with a live nativity scene, freezing temperatures, and stalls selling arts/crafts and mulled wine. The newest zoological garden in Slovakia is home to some 250 animals of 70 species, including a leopard, a camel, and a chimpanzee. The 8-hectare grounds include an arboretum, playgrounds, food kiosks, a patisserie, and a gift shop. April 20 to May 31 & July 1 to October 20: Tuesday-Sunday 10:00 a.m. to 6:00 p.m.
June: Tuesday-Friday 9:00 a.m. to 6:00 p.m., Saturday-Sunday 10:00 a.m. to 6:00 p.m.
Closed on Mondays and from October 21 to April 19. No city in Slovakia can do without a rope park nowadays, and Spišská Nová Ves is no exception. Four courses with 37 different obstacles up to four meters / 13 feet above ground are sure to tire out both parents and children. June 1 to September 19: daily 10:00 a.m. to 7:00 p.m.
April, May, rest of September, and October: weekends only 10:00 a.m. to 6:00 p.m. Admission: adults €7/60 min., children €3.50/30 min. The outdoor Summer Pools (a 50 m pool for swimmers, three non-swimming pools, a children’s pool) are only open in the summer. The facility includes 5 refreshments kiosks and a restaurant at the adjacent hotel. Indoors: daily 9:00 a.m. to 7:00 p.m.
Spišská Nová Ves offers easy access to the Spiš Region’s natural and historical splendor. Markušovský kaštieľ (Markušovce Manor House), built in the Renaissance-Baroque style, houses a museum of historical furniture. The adjacent Letohrádok Daradenly (Summer Residence Dardanely) has an exhibit of keyboard instruments and serves as a concert hall. Stop here on the way to the Poráč Valley (see below). The small town of Levoča is less than half the size of Spišská Nová Ves but more than twice as impressive. The rectangular Master Pavol Square, featuring the Gothic Roman Catholic Church of St. James, which houses the world’s tallest wooden altar, made by Master Pavol of Levoča, the Renaissance Town Hall, and the Neo-Renaissance Thurzo House, is a Municipal Monument Reserve and the principal reason for Levoča’s inclusion in the UNESCO World Heritage List. Towering over the town, Mariánska hora (Maria Mountain, 781 m), with its Church of Virgin Mary’s Visitation, sees Slovakia’s largest pilgrimage every July. Levoča is a short train ride away from Spišská Nová Ves. 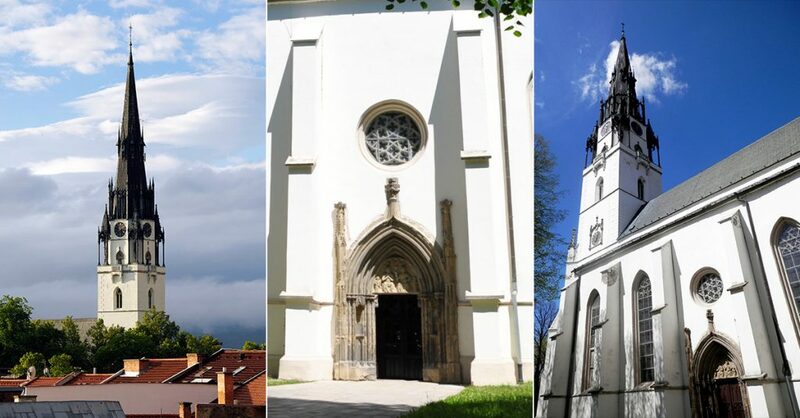 Learn more in our upcoming guide to Levoča. Nicknamed the Slovak Vatican, Spišská Kapitula is a medieval ecclesiastic village and the seat of the region’s bishopric. The late-Romanesque Church of St. Martin is a gem. 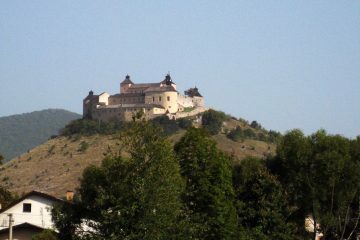 The nearby Spiš Castle is the biggest castle complex in Central Europe and included on the UNESCO World Heritage List. Learn more in our upcoming guide to Spišská Kapitula and Spiš Castle. Poráčska dolina (Poráč Valley) sits below the old (1247) mining village of Poráč. Relax in a rental cabin, have a meal and brewed-on-premises lager on the hike across the valley from Poráč to another mining village, Slovinky. The surrounding hills turn into skiing slopes in the winter. Buses to Poráč leave multiple times daily from the Spišská Nová Ves bus station. Národný park Slovenský raj (Slovak Paradise National Park) features a series of interconnected canyons, including the longest river canyon in Slovakia, ravines, gorges, as well as the country’s biggest ice cave, carved into the forested hills to the west of Spišská Nová Ves. Because it’s easily accessible and featuring 300 km / 186 mi of hiking and 400 km / 249 mi of biking trails plus plentiful rock- and ice-climbing opportunities, Slovak Paradise is one of the most visited natural attractions in the country. You can access Čingov in Slovak Paradise on foot (approx. 3 hours from downtown Spišská Nová Ves), or by regional or local bus*; Hrabušice is a bit further out but accessible by regional bus. Learn more in our comprehensive guide to the Slovak Paradise National Park (coming soon). Getting here: Spišská Nová Ves is easily accessible by train. Buses are mostly local, roads in and out two-lane. Spišská Nová Ves as seen upon a southeastern approach, from the road from Košice. Photo CC-BY János Korom. Train: The town is a stop on Slovakia’s major rail line Košice-Žilina. A number of trains of all categories, from the directions of Košice or Bratislava / Žilina / Prague, stop in Spišská Nová Ves. Bus: Regional buses connect Spišská Nová Ves with villages, towns, and natural splendor in the vicinity (see above in Beyond Spišská Nová Ves). Once you’re here, you can easily take in the city on foot (the train station is a 10-minute walk from the main square). Or take local public transit if you must. * Transit information is either only available in Slovak or can be confusing. Email us with questions or for a travel consultation. You’ll likely only need to stay in Spišská Nová Ves one night. Make it count in one of these fine establishments, each of which has a highly-rated restaurant on premises. Hotel Metropol is hands down the best classic hotel in Spišská Nová Ves located perfectly halfway between the bus/train stations and the historic downtown. If you want to rest up before your hike in the Slovak Paradise or relax afterward, Hotel Metropol Spišská Nová Ves can’t be beat—not just for the rooms but also for additional on-site facilities like a wellness spa with hot tubs and saunas (yes, plural). While Grill Bar has been a mainstay of the city’s nightlife for a while, the hotel part only opened in 2017. The newest hotel Spišská Nová Ves has to offer is as clean as it gets. The attic rooms are spacious with an en suite bathroom with floor heating (though no view). With the popular restaurant/pub downstairs, it’s a full package. Third but not least, Penzión Venuša (Guest House Venus), at the far end of Zimná Street, with rooms that book quickly and helpful staff. The parking lot is tiny so inquire about additional parking. Breakfast included. Traditional Slovak food can be a challenge for an unaccustomed traveler. Here are a few restaurants in Spišská Nová Ves we recommend to their diverse or healthy fare. Dufo is a popular local go-to for breakfast. The simple menu at this modern eatery includes fresh bread with classic accoutrements like jam, omelettes, and oatmeal. Their cakes and vegetarian lunch items are also quite popular. Great (counter) service to boot. All the restaurants we feature here have a daily lunch menu, with a soup-and-entree lunch to be had for under €5. Fusion deserves a special highlight for its novel lunch menu featuring Thai dishes (the dinner menu leans toward meats). Sotto goes all out on Italian food, using fresh and seasonal ingredients in its higher-end menu. The restaurant boasts one of Slovakia’s top 20 chefs in 2014, Eva Polomská, and a cute back patio in the summer. The best pizza Spišská Nová Ves has to offer. Service can be hit-and-miss, but the food out of the stone oven is decent and local frequent the place in droves. Hours: Monday–Thursday 10:00 a.m. to 10:00 p.m., Friday–Saturday 10:00 a.m. to 11:45 p.m., Sunday 11:00 a.m. to 11:00 p.m.
Zbrojnoš’s claim to fame is the medieval decor and wait staff occasionally dressed in period outfits. As you might expect (the name translates to Armiger), the menu in this basement restaurant leans heavily toward meats but, true to Slovak form, there is pizza, too. The duck feast is the main draw in the fall. Hours: Monday–Thursday 10:00 a.m. to 11:00 p.m., Friday–Saturday 10:00 a.m. to midnight, Sunday noon to 11:00 p.m. The best part about Tatra Restaurant, locally known for hosting large parties like weddings or graduations, is its location only a block away from the train station. The second-best: in many ways, including the service, decor, and odor, it’s a throwback to the pre-1989 period. Likely to be just fine on most days, it’s a good bet for the adventurous. Hours: Monday–Friday 11:00 a.m. to 10:00 p.m., Saturday–Sunday 11:30 a.m. to 10:00 p.m. The highest-rated restaurant in Spišská Nová Ves, and the best known, is located in a medieval row house next to the Tourist Information Center. The decor matches the restaurant’s name, while the menu features selections from various world cuisines (pasta, burritos, steaks) and rotating seasonal dishes. The big summer terrace, the first in the city, right on the main drag is an ideal people-watching spot. Family-friendly, too, with a summertime play area for kids inside. Hours: Monday–Thursday 10:00 a.m. to 11:00 p.m., Friday–Saturday 10:00 a.m. to midnight, Sunday 11:30 a.m. to 10:00 p.m.
Nostalgie Restaurant is located next to the Tourist Information Center. Photo CC-BY-SA Jozef Kotulič. The Promenade Restaurant prides itself in having a local “Kid-Friendly Restaurant” certificate thanks to the well-equipped children’s play area. The restaurant itself is a classic Slovak restaurant with a daily lunch menu and an eclectic regular menu featuring bryndza cheese specialties. Hours: Monday–Saturday 7:00 a.m. to 10:00 p.m., Sunday 10:00 a.m. to 10:00 p.m.
With 36 different subs plus burgers and doner kebabs, Sun Bageteria has a sandwich for everyone, including anti-vegetarians. Fast, tasty food downtown. Hours: Monday–Thursday 7:00 a.m. to 7:00 p.m., Friday 7:00 a.m. to 9:00 p.m., Saturday 8:00 a.m. to 2:00 p.m.
Where it skimps on creative naming, Burger a Pivo goes all out on burgers (giant and juicy), decor (American-themed, with a sense of humore), and service (just great). Wash it all down with tasty Slovak beer and roll into a nearby cafe to digest. The first outpost of the Poráč nanobrewery is a popular spot on the main drag. Two versions of their famous lager and a guest tap at a friendly downtown watering hole, what’s not to love? The popular Cuba-themed bar, serving rum, mojitos, and sweet Cuban espresso, turns into a night club on Friday and Saturday nights (including everything that comes with it). Golden Cellar bills itself as a wine bar, and it is spectacularly so in the basement of a medieval town house across from Reduta at the quiet, far end of Letná Street. But it’s the patio, perhaps the best in town, particularly after dusk, that takes the cake (of which there are plenty on the menu). Coffee and wine (and beer and spirits), you’ll be fine. Hours: Monday–Thursday 9:00 a.m. to 10:00 p.m., Friday –Saturday 9:00 a.m. to midnight, Sunday 2:00 p.m. to 10:00 p.m. While every restaurant serves coffee and there are a number of coffeeshops all over town, El Ara is reputedly the best in Spišská Nová Ves. Plus a full bar, works by local artists on the walls, and artsy events. Hours: Monday–Thursday 8:00 a.m. to 10:00 p.m., Friday 8:00 a.m. to midnight, Saturday 10:00 a.m. to midnight, Sunday noon to 8:00 p.m. Hours: Monday–Thursday and Sunday 9:00 a.m. to 7:00 p.m., Friday–Saturday 9:00 a.m. to 8:00 p.m.
What you would expect: a juice bar. Owned by a young couple, Lucky Juice exemplifies the next, healthier and more worldly culinary generation, borrowing even the standard 9 to 5 for opening hours. Worth a quick stop on your way to or from the train station.